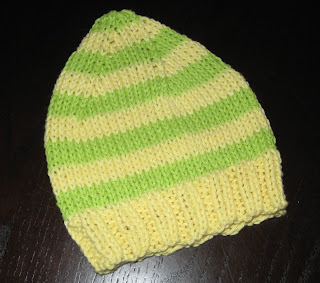 All last week, I set out to knit a baby hat a day. It may seem an odd goal, especially since I don't know any babies, but I like to knit. In the evenings, when the chores are done, mostly, and it's time for sitting with your feet up in front of the TV or relaxing in your favorite chair, making something simple and quick like a baby hat is just the ticket. 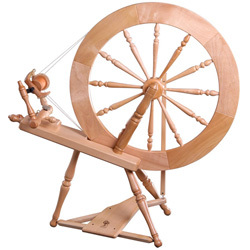 I have a pattern memorized, and I have tons of yarn squirreled away, so all I had to do was get to work. 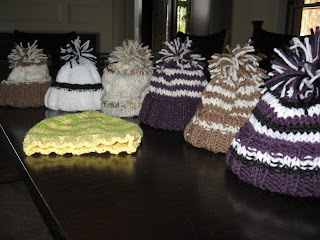 After I finished these hats, I began an online search for a charity looking for knitted baby hats. I found charities that wanted money and charities that wanted ball caps autographed by celebrities, but it took me a while to find the group I was looking for. I will be sending this collection of hats in unconventional colors to the Akron Children's Hospital. Using all-cotton worsted weight yarn on size 8 (US) needles, cast on 57 stitches. Knit 2, Purl 2 to end. Continue ribbing for 1 3/4 inches. Knit in a stockinette stitch (knit a row/purl a row) for 16 rows. Next Row (odd): knit 10, knit 2 together, knit 10, knit 2 together to end. Next Row (odd): knit 9, knit 2 together, knit 9, knit 2 together to end. Continue decreasing until you complete a row knitting 1, knitting 2 together to end. Knit 2 together to end. Thread yarn through remaining loops and cinch up tightly. Sew seem. Your hats are adorable and I applaud your charity efforts! I also knit hats for my NICU (I work there) so I doubly applaud your efforts. It's not easy to find preemie sized hats and we go through tons. I know she has a list of hospitals in need.